because everything –flowers, bones, people, dogs, rocks—likes to be loved. 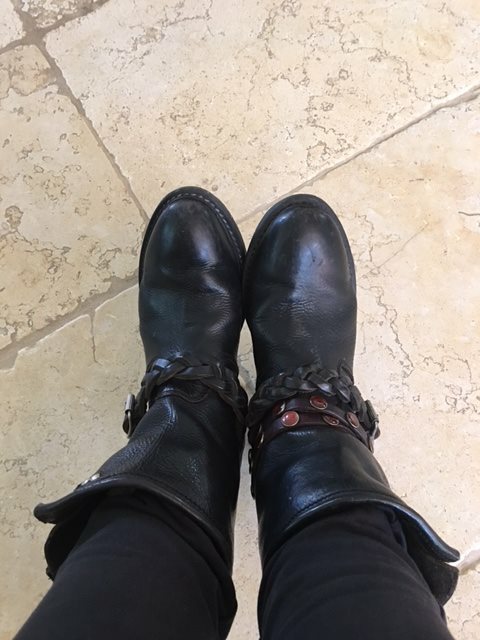 I’ve worn these boots to walk fifty blocks in New York, hike a mountain, talk to Oprah and Katie Couric and pretty much every day for five years. They’ve been resoled four times and been adorned by friends (notice the boot belt. A friend’s birthday present to me). My mother would say that they don’t owe me anything at this point. It’s true. But. I’ haven’t said thank you enough to them (or, for that matter, to my legs that carry me and heart that beats me and eyes that see and arms and toes and kidneys and liver and, and, and) So anyway, thank you boots.